Common Name: Fresh-water turtle shell, Chinese turtle shell. Part Used & Method for Pharmaceutical Preparations: The shell can be removed after the turtle has been boiled for one or two hours. Functions: 1. To nourish yin and subdue yang; 2. To soften hardness and disperse nodules. 1. Internal stirring of endogenous wind following the later stage of febrile disease in which yin and body fluids are consumed or tendons and muscles are not nourished manifested as tremulous fingers, spasms and convulsions, thready and rapid pulse and dry tongue proper with scanty coating. Turtle shell (Biejia) is used with Oyster shell (Muli), Donkey hide gelatin (Ejiao), Fresh rehmannia root (Shengdihuang) and White peony root (Baishao) in the formula Erjia Fumai Tang. 2. Deficient yin with fever; a) deficient yin and body fluids at the later stage of febrile disease manifested as night fever and subsiding in the morning without sweating and red tongue with scanty coating. 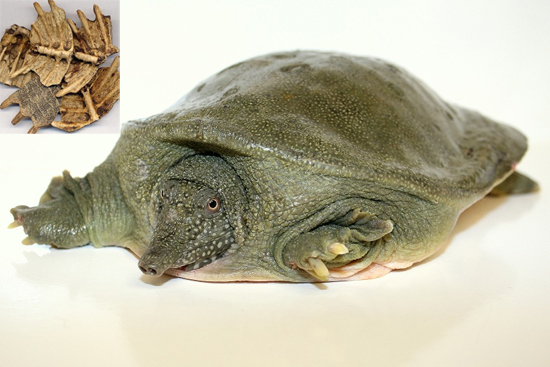 Turtle shell (Biejia) is used with Sweet wormwood (Qinghao) and Moutan bark (Mudanpi) in the formula Qinghao Biejia Tang; b) deficient yin with internal heat manifested as afternoon fever and night sweating. Turtle shell (Biejia) is used with Stellaria root (Yinchaihu) and Wolfberry bark (Digupi) in the formula Qinggu San. 3. Chronic malaria with amenorrhea manifested as hypochondriac pain and hard, palpable masses in the epigastric and abdominal regions. Turtle shell (Biejia) is used with Zedoary (Ezhu), Burreed tuber (Sanleng), Moutan bark (Mudanpi) and Rhubarb (Dahuang). Dosage: 10-30 g, decocted prior to other herbs. For replenishing Yin and suppressing Excess Liver Yang, it is used unprepared; for softening lumps and resolving masses, it is stir-baked with vinegar. Cautions & Contraindications: Contraindicated in patients with poor appetite or loose stools due to Spleen and Stomach Deficiency; contraindicated during pregnancy.